Great is our Lord, and greatly to be praised! I'm so thankful that God's mercies are new every day! Oh.. gracious is our Lord...., and blessed be his name. Holy in all his works...., and righteous in all his ways. Great is our.. Lord, and greatly to be praised. His compassions never fail. They're new every day. fall like dew by God's grace. 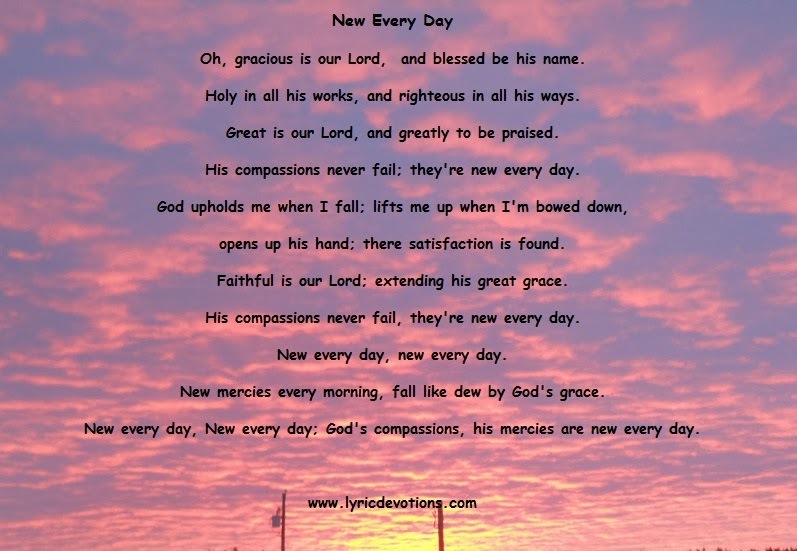 God's compassions, his.... mercies are new every day. opens up his.. hand.....there satisfaction is found. Faithful is our Lord..... extending his great grace. 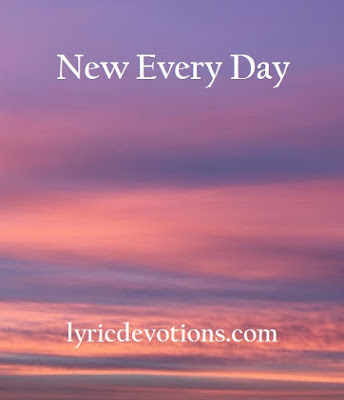 His compassions never fail, they're new every day. God's compassions, his mercies are new every day. Psalm 145:3 Great is the Lord and greatly to be praised; and his greatness is unsearchable. Psalm 145:8 The Lord is gracious, and full of compassion, slow to anger, and of great mercy. Psalm 145:14 The Lord upholdeth all that fall, and raiseth up all those that be bowed down. Psalm 145:16 Thou openest thine hand, and satisfiest the desire of every living thing. Lamentations 3:22,23 It is of the Lord's mercies that we are not consumed, because his compassions fail not. They are new every morning: great is thy faithfulness. Deut. 32:2 My doctrine shall drop as the rain, my speech shall distil as the dew, as the small rain upon the tender herb, and as the showers upon the grass. I was reading Psalm 145 one day, and so many verses jumped out at me that I had to write them into a song. At first, I thought verse 1 was the chorus, but it just wasn't coming together, then two other verses in Lamentations came to me and I knew I had the chorus. I fiddled around with a couple of different sounds for the melody, and then set it aside. A few days later, I sat down at the piano and started plunking out a new melody, and I knew right away it was the one for this song. Good for you, Deb. I wish you would take some piano lessons. I was reading a songwriter's book that said we need to play an instrument. But you are getting many things done better than I am. It sounds wonderful. My fingers are way too short to learn piano at this point in life...trying to play the chords leaves them aching for days....guitar hurts too! I'll settle for playing enough to figure out the melody, and leave the real playing for others! what a beautiful song ... and the sunrise goes with it perfectly ... what a treasure we hold in earthen vessels - and there are blessings all around us, that God has given us to enjoy!!! !